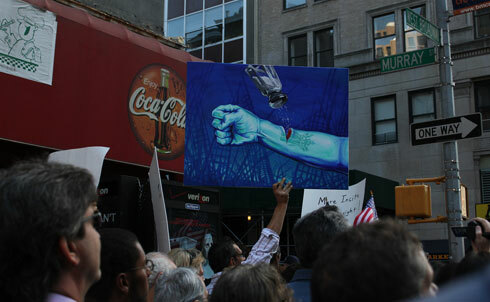 Emotions ran high in lower Manhattan on September 11, 2010, with two competing protests—separated by a few city blocks and tight lines of police—debating the fate of the proposed Park51 cultural center. 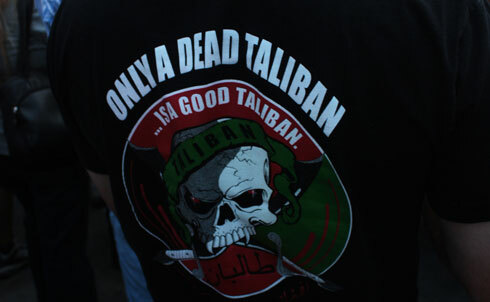 Participants at the "anti-mosque" rally expressed everything from disappointment with the specific project to total distrust of Islam and immigrants in general. 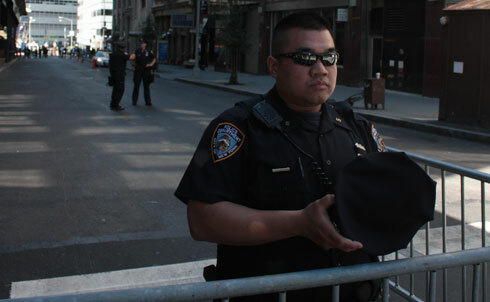 A police officer guards the barricade in front of the proposed Park51 cultural center (background). This block of Park Place was off-limits to the public on September 11, 2010. A curbside debate about Islam draws a crowd. 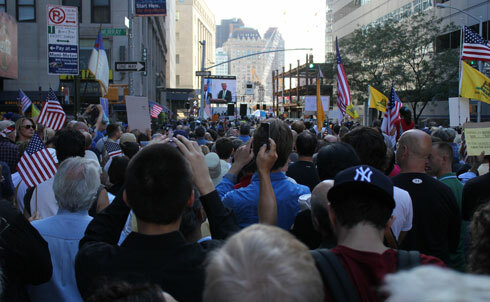 Heated conversations were a common sight on the blocks surrounding Ground Zero. 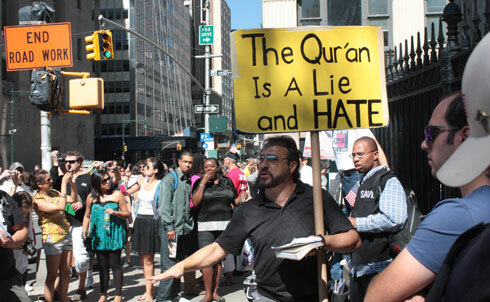 A man declares the supposed evils of Islam in lower Manhattan on Saturday, September 11. Around noon, another man set pages of the Koran on fire blocks from Ground Zero. 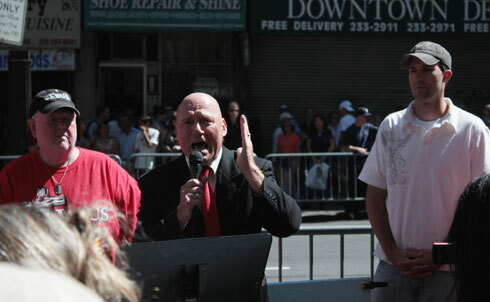 A street preacher representing Operation Save America warns of fire and brimstone before the "anti-Mosque" rally. A number of groups with agendas seemingly unrelated to opposition of the Park51 community center were visible near Ground Zero. 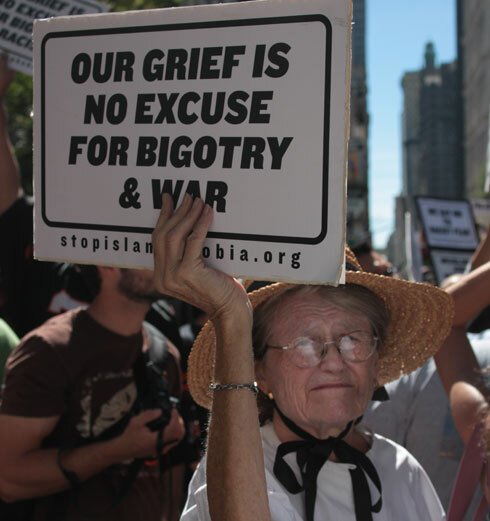 A counter-protest against Islamophobia and racism took place a few blocks to the east of the "anti-mosque" rally. 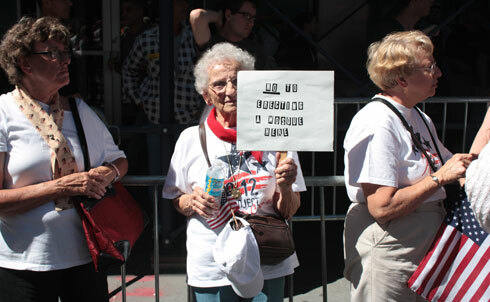 American flags were plentiful at the rally against the Park51 center. 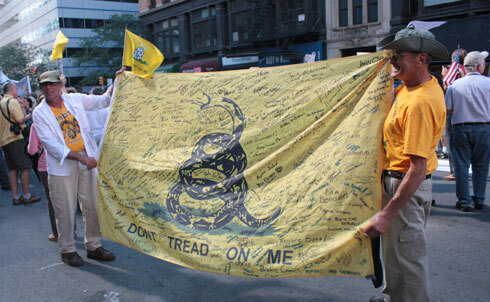 Though the rally’s organizers asked participants to bring flags rather than inflammatory signs, there were still a few criticizing Mayor Bloomberg’s support for the Mosque project and connecting 9/11 to illegal immigration, in addition to the more straightforward variety pictured above. True to Tea Party form, protesters evoked the legacy of American colonialists, with a message of distrust for central government. 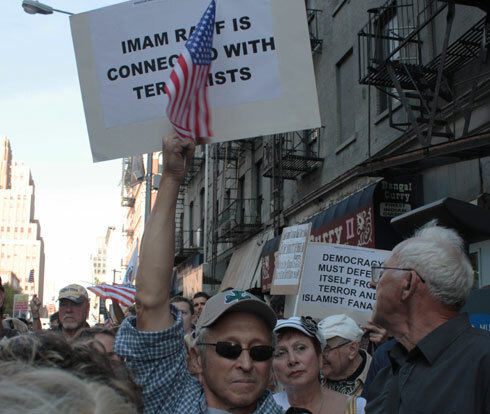 Some protesters held signs accusing Imam Feisel Abdul Rauf, sponsor of the Park51 project, of terrorist connections, and conflating Islam with totalitarianism and terrorism in general. Political correctness was not a priority. Anti-immigrant Dutch politician Geert Wilders was one of the speakers headlining the event. Wilders supports banning the Koran and taxing headscarves, and has come under fire for comparing Islam to Nazism. His speech harnessed the memory of the September 11 terrorist attacks to paint a picture of the West at large under attack from Islam.